Before I forget, for those of you who might not have seen it, the wonderful Abby from Something To Write About had me as a guest on her blog yesterday. Please pop over if you'd like to read the interview (or just to show Abby some bloggy love)! And check out this excitement! Beer Is Zo Moe! 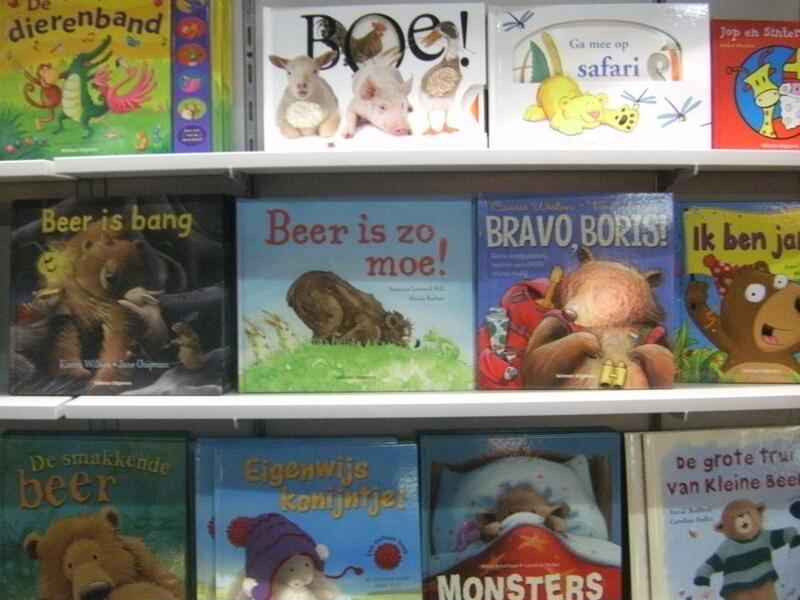 (my Dutch book which, for our English-speaking audience (I'm assuming that's most of us) is Bear Is So Tired!) made an appearance at the Antwerp Book Fair in Belgium! 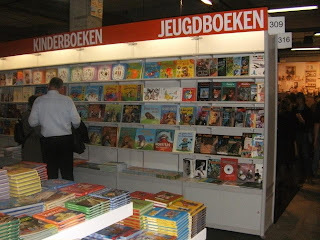 Look at it, up there with all those other books, so famous :) I'm going to go out on a limb and guess "kinderboeken" means "kids' books" but you've got me on "jeugdboeken" - some other kind of book is as close as I can get! Also, Nicole made a coloring page to go along with it. Want to see? Okay. Enough of that. Go get your coffee/tea/hot chocolate/steamer/mulled cider or whatever you're imbibing this morning and your Something Chocolate (it is Wednesday!) - I've got a lovely pan of freshly baked brownies on my kitchen counter for my daughter's study group this evening - they probably won't notice if one's missing - and I think a brownie would make an excellent breakfast :) - but I digress. Get your snack and settle in. It's time for Would You Read It! The Pitch: When Sophie is forced backward in time to 1895 Paris, she takes the identity of a missing Jewish girl and falls for a young Zionist. As the window home closes, Sophie must decide whether to unlock a mysterious heirloom’s secrets and return to her own life of a potential prima ballerina, or live as someone else in the past and lose herself forever. Vicki is looking forward to your thoughts on her pitch! Please join us on Friday for Perfect Picture Books, AND (pretend this is flashing neon!) something SO EXCITING it's going to knock your socks right off! I wish I could show you now, but it's not quite ready, and it has to be perfect, so you're just going to have to wait until Friday! LOVE the coloring page. The picture is adorable. Just for everyone's enlightenment and amusement 'Moe' in Dutch is pronounced 'Moo' but with the lips really puckered forward into a small 'O'. Congrats on 'Beer is zo Moe'! Jeugd is youth! It's so cool to see books translated. Love it! Finding Sophie: H*** Yeah! sounds awesome! 19th century Paris!! exchanging identities, Zionism... very hard final choice... all sounds good to me. I am now going to check out Vicki's blog. How many hours til Friday??? Stina - I know! Isn't it so cute? Joanna - thank you for explaining that. I'm going to go around all day saying "moo" with my lips like that :) And the book wasn't translated from English - the original publication was Dutch! Oh my goodness so happy for you about your bear book, that's awesome. Is that word something to d o with games from the french jeu perhaps? Love the pitch for Sophie, Vicki has encapsulated the plot wonderfully, nice job Vicki! Can't wait for Friday now, is that the last PPBF this year? I passed on the information about your perfect picture books so I hope she comes and looks. 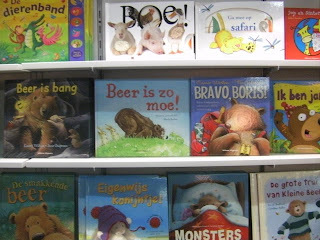 Sorry about not having more to say about the pitch but I want to give you, Susanna, congratulations about having 'Beer is Moe" on the stands in Belgium. Way to go! WOW -- you have impressed me! I didn't realize that you were international. So exciting. Congratulations! What do you mean that the original publication was Dutch? As for Vicki's pitch -- I think she did an outstanding job! There is nothing to be critical about. In fact I love period pieces and the idea of time travel. I certainly would read Finding Sophie. Can't wait until Friday -- sounds mysterious. Great news about bear book! And I would read that YA book because I love time travel stories :) Can't wait for Friday...and I'm still thinking about those brownies! 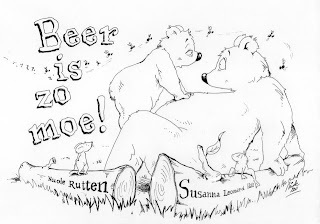 Wow, congrats, Susanna, on Beer is Moe! That is very very cool! Will you be able to go visit your book? And thanks to everyone for the amazing support for my pitch. Please let me know if you think it needs any clarification or tightening or anything. 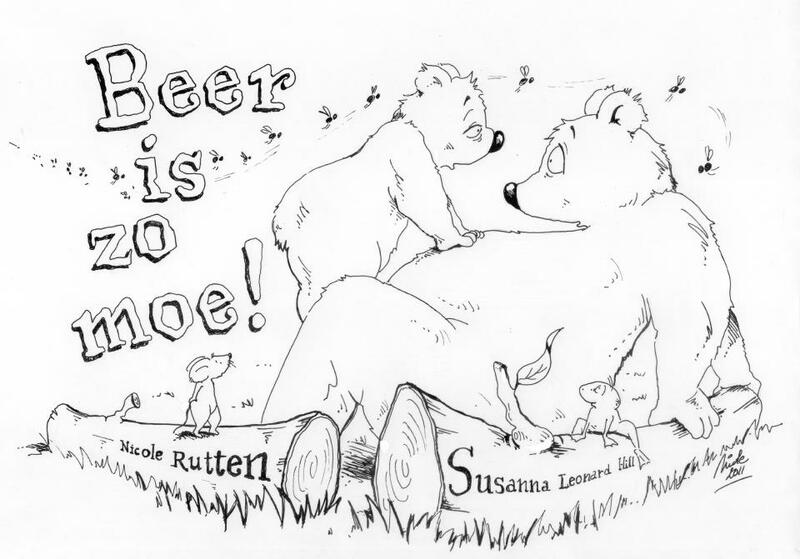 I love your Dutch book, Susanna, and what a cute coloring page! Yes, I would read Finding Sophie because: I love historical fiction, I love Paris, I love ballet, and I love romance stories! Sounds like a winner to me! Susanna, congrats on moving into the Dutch market! That is so cool! As for the pitch -- loved it. Every part of it is intriguing -- the time travel, the setting, the Zionist love angle, the heirloom secret, and the fact that she is a ballerina in the making. There is a lot of information in such a short pitch! That is so cool about your book being available in Dutch, Susanna. You must be tickled pink and over the moon! Paris in 1895? I'm in! And if I were Sophie, I'd stay there, too! There's a lot to be said for losing oneself. This is an enticing pitch with an intriguing touch of mystery. Well done. Sorry for belated responses everyone - I was on the road all day yesterday! Clar - thanks so much! I'll check it out! Renee - It vertainly sounds like a good read, doesn't it? Yes on the pitch. The story sounds very intriguing. Oh WOW! She sounds like an amazing woman! That is a LOT of languages. This book doesn't sound like more normal "cup of tea," but her pitch has intrigued me. It may not be first on my TBR list, but I still think it sounds interesting. Something different than I've heard about and time travel is always fascinating. So... YES! I would totally read this! I love the idea of time travel and the question of "what if" in life. Was just talking to a friend today about how my life would have been different if I had found some way to stay in New Zealand 18 years ago. I'm in. On a side note- I've been so focused on channeling my inner Eminem for the holiday contest that I totally forgot to post a Perfect Picture Book for tomorrow. It's one of my absolute favorites. This pitch intrigues me as I love historical fiction and the idea of time travel. I am sure it would appeal to many children. I also did ballet as a child and can imagine her dilemma.